Naturalized in the Azores, New Zealand, United Kingdom, Ireland, France and California. The Azores and some of the locations in New Zealand are similar to California and it is naturalized in California. Invasive in Ireland, the United Kingdom and New Zealand. In New Zealand it is included in the National Pest Plant Accord list and particularly a problem on the North Island. In Britain, the species is listed on Schedule 9 of the amended Wildlife and Countryside Act 1981 (WCA 1981), because of its documented negative effects on plant diversity. In Britain, it grows in riparian areas and on coastal cliffs down to the high tide mark, indicating a tolerance to salt spray. 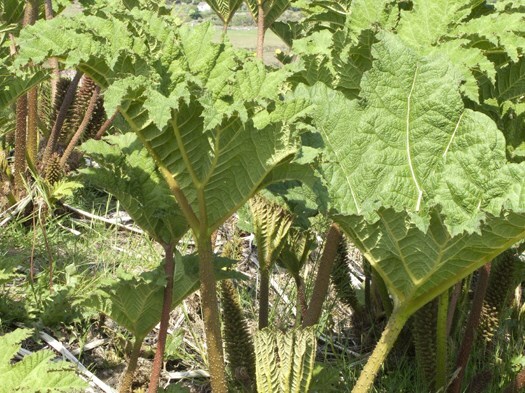 Gunnera also has severe ecological impacts on Sao Miguel Island in the Azores. It can alter the soil seed bank of native communities, change soil biochemistry, and homogenize the seed flora by increasing the relative abundance of weeds and rushes. Gunnera is the only genus of angiosperm that is known to form an intracellular symbiosis with nitrogen-fixing cyanobacteria. Gioria, M., & Osborne B. A. (2013). Biological Flora of the British Isles: Gunnera tinctoria. Journal of Ecology. 101, 243–264. Of the regions listed in Q3, the Azores and New Zealand are similar to California. The only other species listed in Randall 2012 is G. manicata and it is only cited as naturalized rather than invasive. Britain and Ireland do not match California, nor does the area in northern France where it is naturalized. Part of its native range in South America, the Azores, and part of New Zealand do match. It's a split but I don't think it fits the definition of predominantly. Invasive in Ireland, the United Kingdom and New Zealand. In New Zealand it is included in the National Pest Plant Accord list and particularly a problem on the North Island. In Britain, the species is listed on Schedule 9 of the amended Wildlife and Countryside Act 1981 (WCA 1981), because of its documented negative effects on plant diversity. Also has severe ecological impacts on Sao Miguel Island in the Azores. It can alter the soil seed bank of native communities, change soil biochemistry, and homogenize the seed flora by increasing the relative abundance of weeds and rushes. Gunnera is the only genus of angiosperm that is known to form an intracellular symbiosis with nitrogen-fixing cyanobacteria. No mention of this in the thorough review by Gioria and Osborne 2013. The species is edible and it has been reported to have medicinal properties (but may also contain neurotoxins). The areas it invades seem to be focused on riparian areas rather than grazing areas. This is a very large herbaceous plant that grows 8 ft tall with leaves that are 4-8 ft across on 6 ft tall stalks with stiff hairs. Plants have multiple stalks. Given its size and the fact that it can create dense infestations, "impenetrable" stands seem likely. Can spread clonally through a horizontal rhizome system. Rhizomes have been recorded growing an average 15 cm per year. Once established at a site, vegetative spread and dispersal of plant fragments appear to be the most important factors for the persistence of the species. Eradication by mechanical removal has proved effective only where the entire rhizome system was removed together with standing biomass, to prevent any re-sprouting. Produces large numbers of seeds. Estimates of seed production quoted in Gioria and Osborne 2013 include 750,000/plant in Ireland and 250,000/plant in New Zealand. Almost all fresh seeds collected from an invasive population in Ireland germinated. Seeds from a native population in Chile had a 77% germination rate. Seeds are not dormant at maturity and do not have any cold stratification requirements. Germination can occur throughout the year except in winter (results from Ireland). Begins producing seed at about 5 years old. In California, it flowers from July to October according to the Jepson eFlora. One record from the Bay Area in Calflora indicates it flowering in early May. In Britain, Ireland, and the Azores, flowers and fruits appear from April to Oct, and in South America from Oct to February. In the Azores, flowers develop in Feb-March, pollination occurs in April, seeds start forming in May, and fruits mature between July and October. Seeds are thought to be dispersed mostly by birds and water. In Scotland, starlings, redwings, and thrushes have been seen eating and dispersing the fruits. Seeds are thought to be dispersed mostly by birds and water. This species often grows along streams. Reviewed by Tim Hyland, California State Parks, and Ron Vanderhoff, California Native Plant Society - Orange County. Comment by Ron Vanderhoff: Given the climate match statistics and the known habitat and ecology of the species this would seem to be a regional concern. Establishment of the species South of the Bay Area may be unlikely.